The following photographs are of some of the fish that I have had in my tanks over the years. I have had more variety than these but unfortunately I haven't pictures of them all. You may have read my article My Last Aquarium, to go (Eventually) published on 6th April 2016. At that time I had 6 clown loach, 2 harlequins and 2 mountain minnows, and was thinking about not getting any more fish. In January (2017), the only surviving fish left were, 1 Harlequin, 1 mountain minnow and 4 clown loach, so, I started to think about getting rid of the aquarium, decisions had to be made. 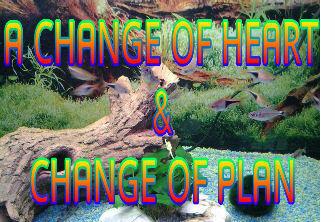 Having just given my 4 foot tank its fortnightly water change and general maintenance, it doesn't seem as easy as it used to be and I also have to persuade myself to do it these days. For quite a while I have been thinking about just having 1 tank because maintenance is getting harder for me. Currently I have just 2 tanks after reducing slowly from 4 to 3 to 2, a Fluval 1200 Duo with 7 clown loach and a Fluval 800 Deep that has 6 small fish. Don’t get to ambitious and take your time setting up your tank and you will find that your patience will pay off.